From the French word for "flower", this collection is true to its namesake. Delicate petals are woven from diamonds and gold, turning nature into fine art you can wear. The daintily designed flowers make a feminine and elegant statement. 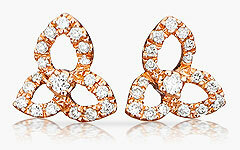 Available in 18k rose or white gold with diamonds.